Collaboration and Team Learning refers to two or more people working together to realize or achieve a learning goal, to collectively share information and experiences, or to pose and solve problems through knowledge sharing. 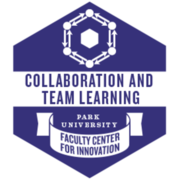 This badge represents focused faculty development to learn about how to support student learning through the integration of collaboration and team learning in their course(s). Recipient participated synchronously or asynchronously in a Faculty Center for Innovation-sponsored learning community on the topic of Collaboration and Team Learning and has produced a written reflection on how the knowledge gained has affected his/her teaching, scholarship, or service.